But when Mina uncovers the victim's identity, she stumbles upon a conspiracy that threatens the lives of everyone in England. To save them, Mina and Rhys must race across zombie-infested wastelands and treacherous oceans-and Mina discovers the danger is not only to her countrymen, as she finds herself tempted to give up everything to the Iron Duke. In Brook's fascinating alternate world, she alters world history as well as England's Victorian society, although the reader will recognize some of the ton's societal values, attitudes, dress codes and politics. In The Iron Duke, the Mongol Horde successfully conquers all of Europe, Africa and Asia as well as other parts of the world. Two hundred years prior to our story the Horde used previously unknown technology to control populations in whole continents, first through war machines and then by infecting them with nanoagents or "bugs" introduced into the blood by different means, and then controlling the nanoagents by remote control or a Tower. When the Horde first attacked Europe, many English aristocrats escaped to the New World, and now that England is free of the Horde, their descendants have returned -- they are called “bounders.” The descendants of those who stayed behind call themselves "buggers." Buggers and bounders see things from different points of view. Brook begins her story with a ball and a murder. Detective Inspector Mina Wentworth is also the daughter of an Earl and a Lady, and she's attending a ball fraught with tension between buggers and bounders when her assistant Newberry arrives to inform her that a body has been found at the Iron Duke's property. Rhys Trahaearn is England's savior -- the pirate who destroyed the Tower and liberated buggers from the Horde and became a Duke. 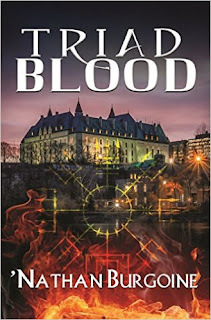 Mina and her assistant Newberry arrive at the Duke's residence to find that the unidentified body of a dead man was apparently dropped from an airship on to Rhys' doorstep. The reader is immediately caught up in the tension and attraction between the two characters. Mina is unsure if hers is real or if it's part of her hero-worship for the man, and Rhys is surprised that he wants a woman at all. This is only the beginning, Mina now has a delicate investigation on her hands and Rhys is not about to stand behind the scenes. Mina has other problems. She "wears the Horde on her face," that's how Brooke states it in the story. Mina's mother was raped by the Horde during a controlled sexual Frenzy and she's the byproduct. Being the daughter of a Countess doesn't make it easier, it makes it tougher for herself and her family -- her Asian features are a reminder of "bugger" slavery. As an inspector her job takes her through the seediest parts of London and Newberry acts not only as her assistant, but also as her bodyguard to prevent personal attacks. The aristocrats are no better. These experiences make Mina both strong and vulnerable, cynical and sensitive and I enjoyed all aspects of her personality -- even her insecurities. She yearns for normalcy and will sacrifice anything for a family that has always shown love and support. After a visit to the Blacksmith, the body is identified as that of the captain of Marco's Terror, Rhys' beloved ship. As information begins to fall into place, Mina and Rhys find themselves on a train to Chatham and soon after an airship, as they race against time to save the lives of those aboard the Terror including Mina's youngest brother. But there's more... this adventure takes our protagonists on a battle against krakens, nanoagent infected zombies, the Black Guard, traitors and more! Brooke doesn't skimp on action, twists, turns, friends or foes and I loved every single moment. And she doesn't skimp on steampunk details or atmosphere either. 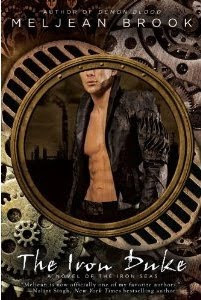 There are mechanical monsters and beautiful clockwork objects integrated throughout this exciting story. The romance between Rhys and Mina is developed throughout their adventure. Rhys first sees Mina as someone that he would like to possess, and pretty quickly his lust turns to admiration and slowly to love. His willingness to do whatever it takes to keep her in his life goes a long way, especially after my initial impressions of him. Mina's admiration for Rhys suffers, she must take him down from the pedestal where she placed him as a hero, to then admire him as a man. Her personal situation, doubts, and society's bigotry play a major role in her decisions and the romance. I loved every nuanced moment between these two. There are quite a few secondary characters in The Iron Duke that play key roles. Yasmeen, Lady Corsair is one of the most prominent and fascinating characters and I hope we'll see her featured in the future. Scarsdale as Rhys' drunken, fun friend with his secrets, loyalty and sad history was a favorite, as was Newberry. And I couldn't help but be intrigued by the Blacksmith! I want to know more about him, his past and what makes him tick. I loved The Iron Duke. It's a fast paced adventure with intrigue and excellent worldbuilding. I loved all the characters, both central and secondary -- heroes and villains -- the steampunk details and atmosphere. This is not a perfect book. I had a few niggles, there were a few details about Rhys and Mina that I wish had been explored, but frankly these niggles were quite minor and overridden by my overall enjoyment. I didn't stop reading this book until that last page was turned and recommend it highly. My reading experience was very similar to yours. Wasn't it just so good?! It took me longer to finish because this steampunk world was so new and fascinating. I needed to slow down to absorb it. I had a few quibbles, too (mainly to do with the romance) but not enough to stop me from calling The Iron Duke a fabulous read. I'm skipping the review, sorry LOL. I'm just glad to see your grade though. I don't know why, but for some reason, I'm putting it off, sigh. Scorpio M, it WAS a fabulous read! I'm so glad you enjoyed it too. The whole adventure and the steampunk world was definitely fascinating. I gobbled up this book and will probably re-read it at some point -- so many wonderful details, right? I was fascinated by Lady Corsair and the Blacksmith. I loved Scarsdale, lol. What a great group of characters! I skipped to the last paragraph and the grade since I haven't read this yet. I did read Brook's novella and really loved Ivy. I was hoping she would be heroine of this one. Is she in The Iron Duke at all? Orannia, I hope your library will get it. Good luck and enjoy! I'm so glad you read this already. I can't wait to read it, too. I plan on reading the novella first, though. But I think The Iron Duke will be my first full length novel on my iPad! Weeeeeee!!!! Blogger Friends, Books & a Grrreat Time! !